A love of all things handmade in our country has always been. That is why even with the abundance of cheap consumer goods, our wives do not deny yourself the pleasure to sew beautiful and most importantly practical bag for trips to the store. Perhaps not in our everyday life more practical fabric than denim. It is the pants or skirt from this fabric will make a great base for shopping bags. So, strut jeans inseam, and then the line zipper and the back seam. You get two paintings, of which will need to find details of the bag. The shape of the bag can give any. In this case to build pattern is very simple. 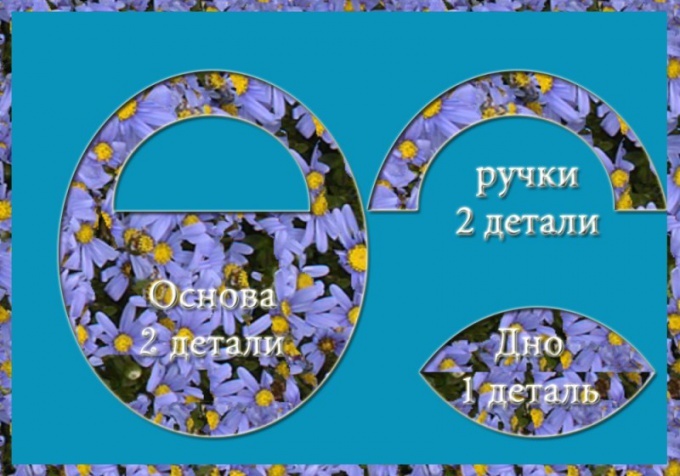 Take a piece of Wallpaper, draw the oval as shown on the main picture. Inside, draw a semicircle on how close he is to the edge, will depend on the thickness of the handles. Cut the item received - this will be the base of the bag that others will see first. To obtain the pattern pens apply the framework and draw handles. To obtain the pattern of the bottom, in the same way, apply the Foundation onto the paper and trace the bottom edge. Invert, apply again. Apply a pattern on denim fabric. You will need 2 items the basics, pens, and 1 detail of the bottom. For greater strength bottom fabric can strengthen doubleroom. The fine stitching details of the bag are the following:- put the handle on the basis of wrong side to wrong side, fold the edge and prostrochite;- to the bottom of the basics sew the bottom;- connect details the foundations of the side seams from the inside, remove the bag on the front side and make finishing seams.- vacate the zipper between the handles. Bag shaped like that in itself makes this accessory fashionable. But to give it greater brilliance, cut from the same jeans flowers. It's easy: Cut the fabric into strips of width 5 cm Fold in half and sew them from the inside as if you sewed the belt. Turn on the front, one side probarte. Sew the flower in the area of one of the handles. The core of the flower can be finished with beads. They can also decorate the rest of the bag.